The Universal Precautions Toolkit was developed by a team of physicians, public health nurses, researchers, and others based on the premise that everyone has trouble understanding difficult and complex information, and that all patients benefit from clear communication. Dr. Weiss conducted this workshop using the second edition of the toolkit. The purpose of the workshop was to familiarize participants with the toolkit for potential use in their own practices. 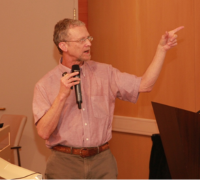 Before he started the hands-on part of the workshop, Dr. Weiss explained the AAFP Demonstration Project, which visited medical practices across the country and observed use of the first edition of the toolkit. He showed the example of the Medication Review tool, and how it improved medication review effectiveness in the practices they observed: patients brought in more medications, more problems were identified, more changes in medications made, etc. The second edition of the toolkit was based on the results of the demonstration project. Dr. Weiss split participants into groups and had each group choose one tool in the toolkit to explore. The goals were to become more familiar with the content of the tool, discuss how it might be used in participants’ settings, how patients might benefit, what parts of the tool might be harder to use, and how to overcome barriers to implementing the tool. After working in small groups for about 15 minutes, each group reported back to the main group. Overall, the groups found the toolkit had great potential for use in their practices. They also found it useful to explore the toolkit using the embedded links. Some teams expressed that certain activities appeared time-consuming and hard to incorporate into their practice. Dr. Weiss said that this observation reflected what they had learned in the demo project; but that practices found that, while it took a lot of upfront work to implement a tool, using it led to better results long-term; e.g., fewer return visits, better patient satisfaction, etc.